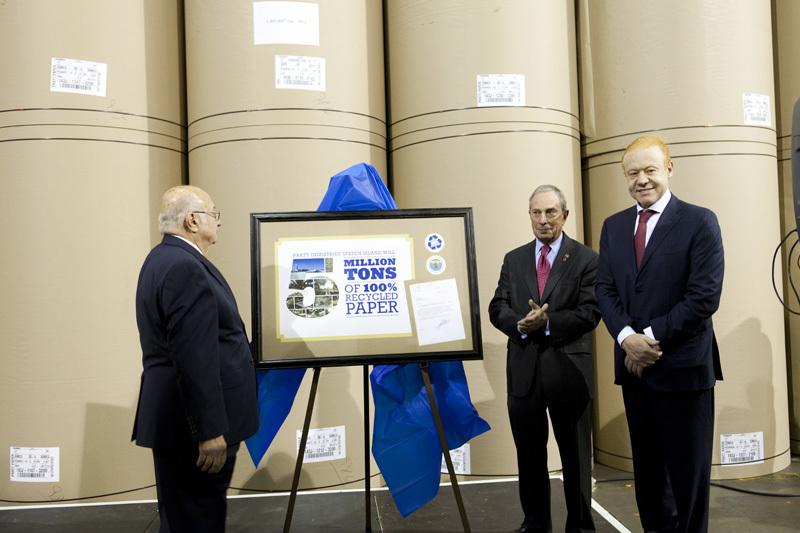 Company chairman Anthony Pratt is joined by New York City Mayor Michael Bloomberg (center) and Staten Island Borough President James Molinaro (left) at the unveiling of the plaque celebrating the mill's paper-making milestone. Just a few hours before Pratt announced plans to build a fourth paper mill, New York City Mayor Michael Bloomberg issued an official proclamation declaring September 17 “Pratt Industries Day” in the Big Apple to commemorate the recent production at our Staten Island mill of 5 million tons of recycled paper. “About half of all the paper New Yorkers recycle is shipped here and recycled through the Pratt mill,” the Mayor told an audience of Pratt customers, political and business leaders and mill employees. 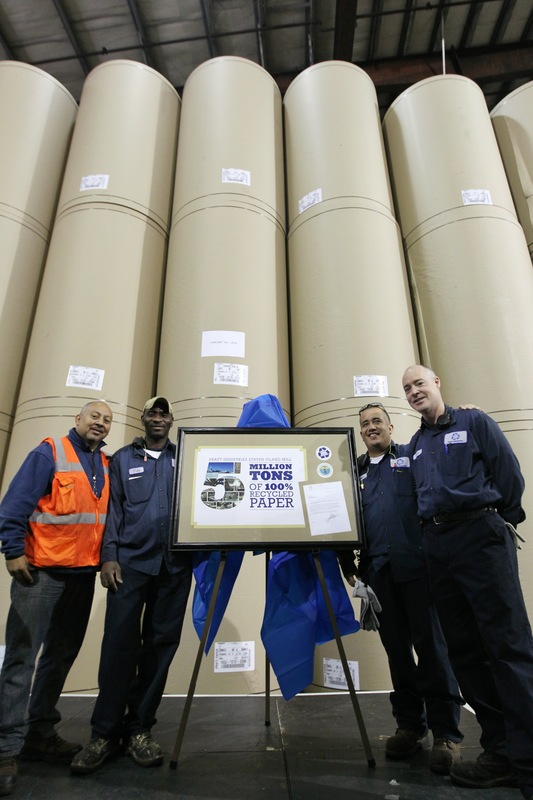 Some of the team that helped produce the 5 million tons (from left): Jerjes Alvarez, Warehouse Operator; Tola Odunuga, Paper Mill, Lead Operator; Santos Arroyo, Paper Mill Shift Manager; and Steve Mullet, Paper Machine Superintendent. “And we would like to do even more by turning even more locally-generated paper into even more jobs and creating even more economic security for this great city,” he said. Anthony also made special mention of employees at the mill, who have produced enough paper to fill the Empire State Building more than 4 times! Not to be outdone, Pratt’s sister mill in Conyers recently passed the 6 million ton mark, and our 3rd mill, in Shreveport, La., has produced more than 1.5 million tons since start up in 2009.